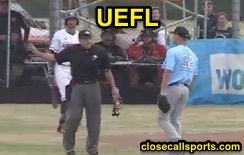 Australian Baseball League Umpire Trent Thomas ejected Sydney P Todd Grattan for throwing at Canberra batter David Kandilas in the midst of a 32-run ballgame at the maiden Wollongong Classic: that would be 21 runs for Canberra and 11 for Sydney; Blue Sox relief pitcher Grattan was thrown out of Sunday's game in the 8th inning, when the score was only 17-11. With none out and none on in the top of the 8th inning, Cavalry lead-off hitter David Kandilas took a 3-0 pitch from Grattan for a called fourth ball, resulting in Grattan's ejection as the offending pitch sailed over Kandilas' head, after which the benches half-heartedly cleared. Grattan, who only faced batter Kandilas, was charged with one earned run when Kandilas subsequently scored on teammate Kyle Perkins' double off of emergency reliever Michael Campbell (position player pitching). At the time of the ejection, the Cavalry were leading, 17-11. The Cavalry ultimately won the contest, 21-11. Trent Thomas previously ejected Blue Sox DH Trent D'Antonio in January for arguing a ball call. Wrap: Sydney Blue Sox vs. Canberra Cavalry (ABL), 11/27/16 | Video via "Read More"